Three local teams have discovered who next stands in their way on the long road to Wembley. 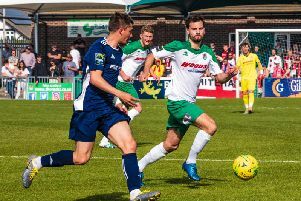 Bognor will be away to Bracknell Town in the first qualifying round of the FA Trophy. The will take place on Saturday, October 27 at Bracknell's Larges Lane ground, with the winners taking home £3,250 in prize money. Bracknell play in division one south central of the Bostik League - one league below the Rocks. They are currently in third place. It's a competition in which Bognor got to within one game of the Wembley final in 2016, losing 3-1 over two legs to Grimsby in the semis. In the FA Vase second round, Chichester City - quarter-finalists last year - will host Windsor at Oaklands Park on November 3. Windsor play in the premier division of the Hellenic League and also reached the Vase last eight last season. The same date will see Pagham at home to fellow SCFL premier side Peacehaven in the Vase. Selsey and Sidlesham have alreadt slipped out of this season's Vase, Sids going down 2-0 at home to Chatham in the first round on Saturday in front of a large crowd.